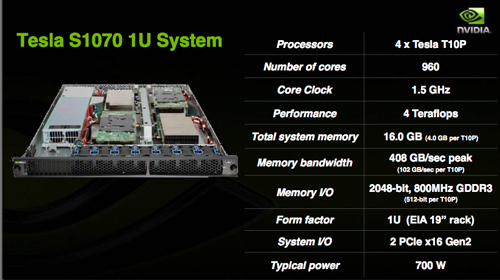 A new massively parallel processor with up to 240 cores powers all the new offerings. 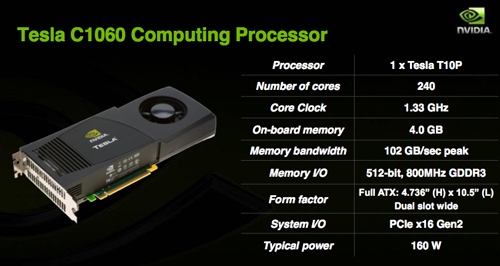 NVIDIA today announced a series of products aimed at the high-end gaming and high-performance computing markets. Both the GTX 200 Series video cards and the Tesla C1060 and S1070 processors are centered around a new massively parallel processor, known as the GT200 in the graphics context or (a bit confusingly) the T10P when used in the Tesla processor units. The GTX 260 and 280 cards have 192 and 240 cores, respectively, and deliver what NVIDIA claims is "up to a 50%" increase in performance over previous generation NVIDIA 9 Series cards. The 240-core version of the new processor also forms the heart of the new 10 Series Tesla processor cards. The C1060 is a PCI Express Gen2 card designed to work in standard desktop machines and delivers nearly Teraflop performance, and the S1070 is a 1U server box with four of the 240-core processors inside, for a total of 960 cores. The S1070 is designed to work with a host server box, and is connected to the host machine via two external PCI Express Gen2 cables, which are manufactured by NVIDIA. Both of the Tesla units are designed to take advantage of NVIDIA's CUDA programming environment, which is based on standard C, but adds the ability to define blocks of code that should be processed in parallel rather than sequentially. Those blocks are shunted off to NVIDIA's nvcc compiler which compiles for the GPU.